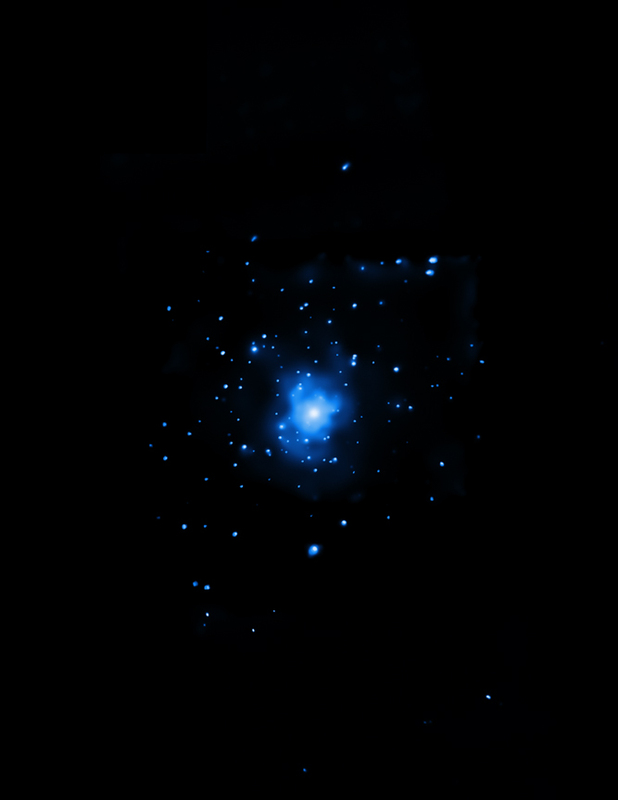 The biggest black holes may feed just like the smallest ones, according to data from NASA's Chandra X-ray Observatory and ground-based telescopes. This discovery supports the implication of Einstein's relativity theory that black holes of all sizes have similar properties, and will be useful for predicting the properties of a conjectured new class of black holes. 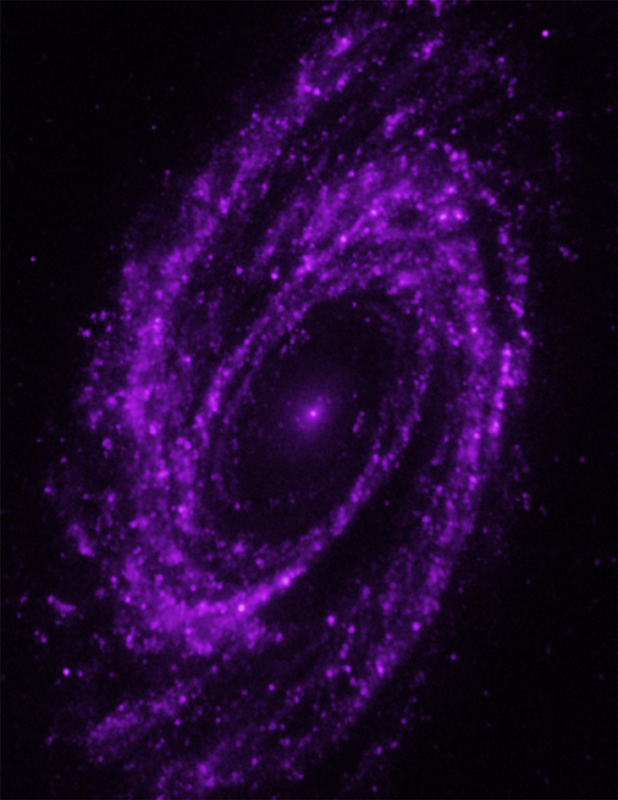 The conclusion comes from a large observing campaign of the spiral galaxy M81, which is about 12 million light years from Earth. 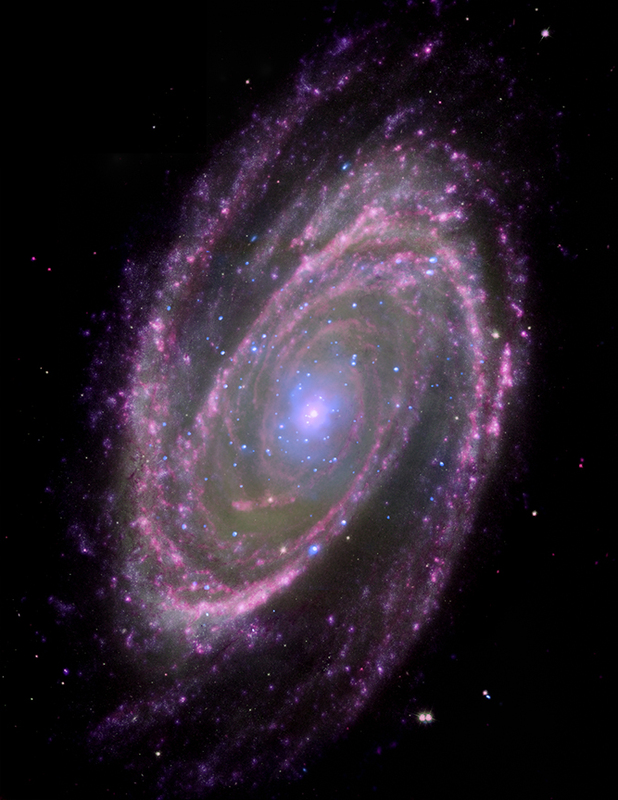 This composite NASA image of the spiral galaxy M81, located about 12 million light years away, includes X-ray data from the Chandra X-ray Observatory (blue), optical data from the Hubble Space Telescope (green), infrared data from the Spitzer Space Telescope (pink) and ultraviolet data from GALEX (purple). 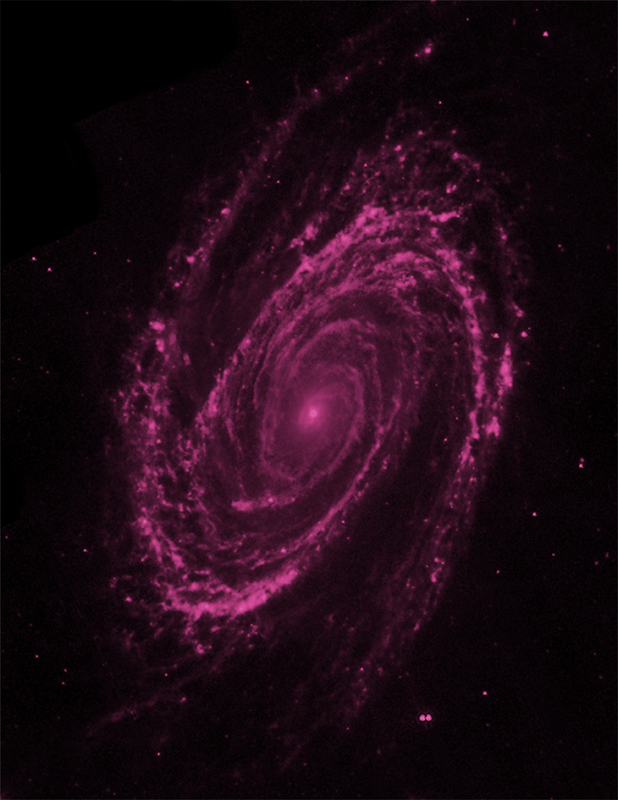 At the center of M81 is a supermassive black hole that is about 70 million times more massive than the Sun. 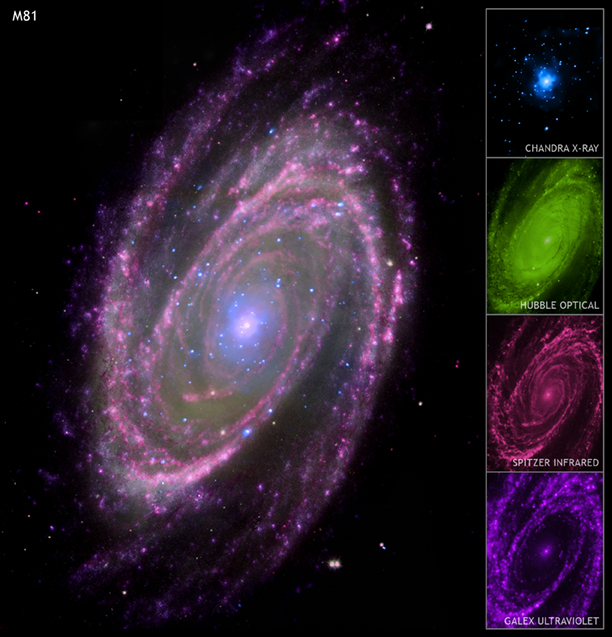 These NASA images of the spiral galaxy M81, located about 12 million light years away, show optical data from the Hubble Space Telescope (green), infrared data from the Spitzer Space Telescope (pink) and ultraviolet data from GALEX (purple). 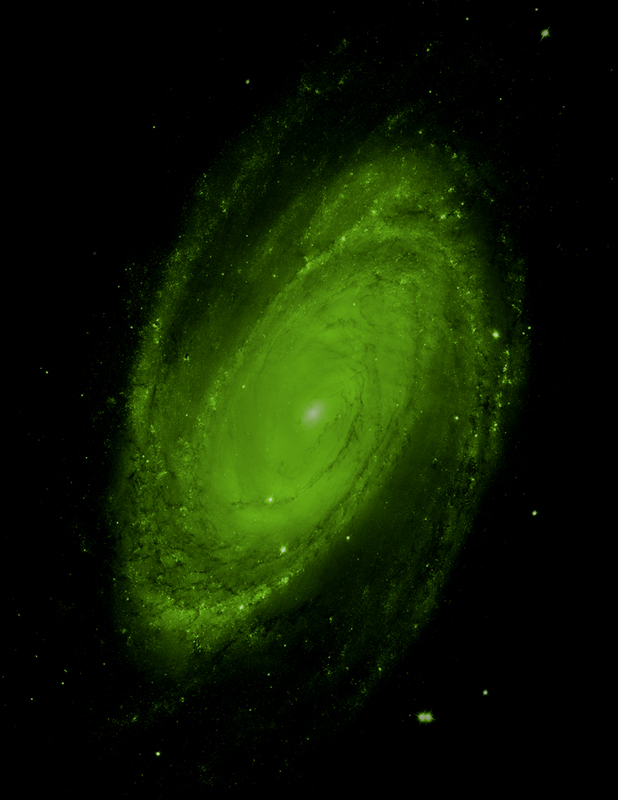 At the center of M81 is a supermassive black hole that is about 70 million times more massive than the Sun.